The rotor shaft seals on my old Howard 200 leaked badly. I replaced the oil in the gearbox with liquid grease and all I got was the occasional drip coming out. Thanks Jim ! I’ll pick it up on Tuesday. By the way, you were right re. the old clutch: the friction ring had become detached and was stuck to outer drum. Came off in one piece, so all I need to do now is clean it all up and re-assemble it, after glueing the ring back on. I believe that is about right on these old 2 strokes using 30 grade oil. If using 2 stroke oil it can usually be relaxed to about 24:1, although I always err on the oily side especially as some old Villiers have plain bearings don’t use crank seals and rely on a oily mix to stop crank-case leakage. If you require a 16:1 mix that would be correct. Thanks Wristpin. That could well be the problem now you mention it. Strangely though, I have another ATCO with Villiers 2T engine that also has 2 filters. The second one that is a red B&S one though, whereas the one on the A98 is one of those clear ones with a little paper filter inside and is probably more restrictive. Charlie, have just renewed by Paypal. However, as P/P account is in my wife’s name you may not tie it up with me. Her name is Carole. 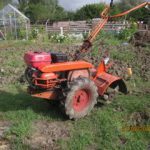 Jim, A 6.5Hp “Villiers” (Honda GX200 copy) will set you back £125.00. As you know, I have a 5.5Hp version on my Wizard and so far it has been fine. Can PM you details if wanted. Just bought this at the West Oxon Steam & Vinatge show. It appears to be all there and once cleaned up, painted and oiled etc., will be used on the allotment when required. Can anyone identify the maker for me ? There’s no makers plate on it nor, are the handles engraved like on Planet machines. An excellent two day’s event thanks to Moggyjim and Karen. Nice to meet familiar faces again and get the chance to use our machinery a bit more than usual. Once again, a few machines disgraced themselves and had to undergo surgery. No need to book in, it’s a “run wot ya brung” week-end. The more varied the machinery the better. However, once you have ploughed be prepared for someone else (probably me) to follow on and rotovate your nicely done furrows ! On the subject of “Chondas” I have a Chinese Honda copy on my Wizard Rotovator. It’s been on about three years now and is fine. In fairness though, it only gets used now and again at low revs ! I think it’s down to personal choice really and whether you are trying to be 100% original or not. Personally, I would go for gloss or perhaps semi gloss. My own Howard 200 I painted in gloss and it is quite shiny. Agriline sell Howard Orange paint. I bought a litre a couple of years ago, it cost about £18.00 then. Am pleased to say my Pegson Marlow pump is now working well again. I treated it to some new “snap-lock” couplings, shortened the suction hose to a more manageable length, put fresh grease in the greaser and gave it a couple of turns and then greased the threads on the primer plug on the top.